Niall Farrell and Margaretta D'arcy in an earlier protest in 2012. AN ACTIVIST WHO was convicted along with Magaretta D’Arcy is set to be arrested on Friday and will be imprisoned according to the Irish Anti-War Movement. Niall Farrell was handed a suspended sentence in June after being convicted of entering a part of Shannon Airport which is closed to the public. Farrell and D’Arcy were both fined and were also told to sign a bond promising that they would not trespass at the airport again. They refused to pay the fine or to sign the bond and D’Arcy was re-imprisoned a number of weeks ago before being released. After speaking to gardaí, Farrell has agreed to return to Ireland and surrender himself for arrest near the Liam Mellows statue on Eyre Square, Galway this coming Friday afternoon. The Galway Alliance Against War will hold a demonstrate at the monument at the time of Farrell’s arrest. In a statement released through the Galway Alliance Against War, Farrell claims that Shannon airport has been used to transport weapons from the US to Israel. “The failure of the authorities to search any US military planes suggests that this type of military equipment continues to travel freely through this airport,” he argues. The irony of our conviction is that the very Air Navigation Act used to prosecute Margaretta and myself gives the Irish state the power to search all aircraft landing at Shannon. Farrell also praised the actions of TDs Mick Wallace and Clare Daly for their attempt to search a US military transport plane in Shannon last week that led to their arrest. Email “Anti-war activist to be arrested and jailed for Shannon Airport protest”. 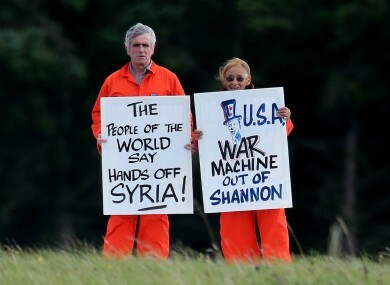 Feedback on “Anti-war activist to be arrested and jailed for Shannon Airport protest”.